Puerta Elvira, one of the entrances to the Albaicin. El Albaicín is the old Moorish quarter of the city. It's located on a hill facing the Alhambra and there are dramatic views of this area from the palace's famous rose gardens. The Zirid Monarchs first established their court here in the 11th century although little remains from this era today, apart from some crumbling remains of the wall (including the section which used to encircle the Albaicín and the gates of El Arco de las Pesas, Monaita and Elvira). The Church of San Nicolás is well worth the steep hike through the Albaicin to marvel at the view of the Alhambra and the Generalife with the Sierra Nevada backdrop. Bill Clinton recently re-visited this spot whilst on a trip to Spain as apparently he had been there once in his student days and had never forgotten the magnificent vista. Nearby is the Church of San Salvador located on the site of the Great Mosque of Granada with a courtyard and Arab font whilst almost directly in front of is the church of San Juan de los Reyes still with its original minaret dating from the Nasrids in the 13th century. Some say that the name Albaicin means "quarter of the falconers", but most historians prefer "quarter of the people of Baeza". When the Moors were driven by the Christians out of the city of Baeza, near Jaen, in the 13th century, they fled to Granada and re-settled on the northern part of the hill, creating a suburb which took on the name of their former home. Most of what we now call Albaicin was in fact the Alcazaba, the Moorish citadel, stretching from the Colegiata del Salvador to the Plaza San Miguel Bajo. Only the western wall of this fortress still exists (it's best seen from the Mirador San Cristobal); the castle keep stood on what is now the Plaza San Nicolás. It was only after the fall of Cordoba, in 1236, that the centre of Moorish power was transferred to Granada - bringing a massive influx of nobles, architects and money which led to the construction of a fabulous new castle on the hill across the river valley: the Alhambra, Calat-Al-Hama or "The Red Castle", so called for its reddish stone. Although most of the Albaicin's churches are built on the foundations of Moorish mosques, and many have conserved their external cisterns for the ritual washing of the faithful, little remains intact from the 8 centuries of Moorish occupation, apart from the great city gates (Elvira, Monaita, de las Pesas and half of Bab-Al-Bonud), the western walls, several interesting minarets-converted-into-bell-towers (the most precious of which is the Alminar de San José) and the courtyard of what was once the Albaicin's Great Mosque, now attached to the church of the Colegiata del Salvador. The story of this church tells us much about Andalucia's difficult transition from Islam to Christianity. It was created as a school - colegiata - to evangelize the Moors, and located in the heart of their medina, although there was such popular resistance that the priests abandoned it repeatedly. The inner courtyard, El Patio de los Naranjos, is one of Granada's finest examples of early (10th century) Moorish architecture (the courtyard can only be visited when the church is open for Mass). The Albaicin is rich in folklore: the Crucifix which stands in the Plaza San Miguel is called El Cristo de las Lañas - the Christ of the Clamps, because of the heavy iron clamps which hold the sections of his broken body together. When the Civil War broke out in 1936, the Republican (leftist) soldiers smashed the statue, leaving the local people to hide the fragments each in a different cellar, until they could be reconstituted after the war. 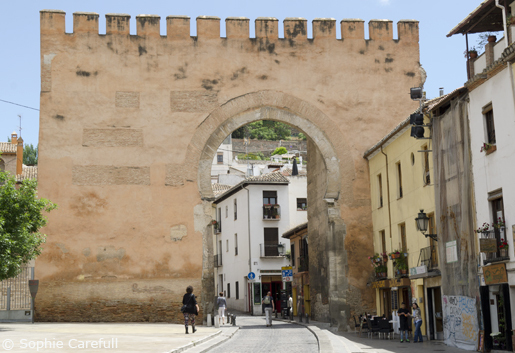 The name of the Puerta de las Pesas - the Gate of the Weights, which you must pass through to reach Plaza Larga, is linked to the market which has for centuries been held in the square (now on Saturday mornings only). When the king's inspectors detected merchants using scales with rigged weights, these pesas were hung on spikes on the wall of the gate. Whatever became of the offending merchants, a few of the blackened, rusty weights can still be seen on the plaza-side of the gate. The Albaicin became a UNESCO World Heritige site in 1994. 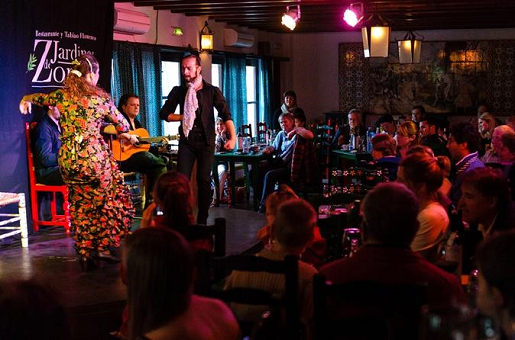 Watch as two flamenco dancers perform at an atmospheric tablao in the Albaycín neighbourhood of Granada, and listen to the passionate sounds of a guitar player and flamenco singer. Watch as two flamenco dancers perform at an atmospheric tablao in the Albaycín neighbourhood of Granada, and listen to the passionate sounds of a guitar player and flamenco singer. With 3 course dinner.